I think one of the problems we (both adults and teens) are not understanding is that these kids are intelligent, but their brains aren’t done growing yet. For example, the prefrontal cortex, a part of the brain that inhibits impulse reactions and controls behavior, isn’t really fully developed until around age 25. Kids who have lived in/near the poverty line probably develop even slower. So a teenager is more likely to explode in a stressful situation. Teenagers are typically natural opportunists and peer pressure can heighten that behavior. I imagine gang leaders know this, so they promise underprivileged teens things they want, even if criminal activity is required to achieve it. If the teen/young adult sees no other role models with these things, they likely fall into the trap. As adults, we must show these teens and young adults the trap. As a parent of a teen myself, I know it seems virtually impossible; I even feel like I failed. I realized that no one parent can do it alone, because today’s world is full of negative influences from every outlet- social media, movies, television, predators on the street, you name it. Most of these churches out here seem to work only for themselves and these nonprofit organizations can only work so hard, as it takes funding to run programs. Many blame careless parenting for the way our children are behaving, but really, lack of accountability goes far beyond them. You can be a great parent and still be an inactive member of your community. Accounting for ONLY your own children will not stop others from being an influence. There will always be other children with absent parents (for whatever reasons) and holding them accountable may take time– if that’s an option at all! Instead, we must return to the African proverb, “it takes a village to raise a child.” Despite fear of the law or repercussions from society, we must approach this situation differently. Specifically, we must call out criminal behavior and speak out at town hall meetings. We must volunteer for nonprofit organizations dedicated to helping our youth. And if we don’t have the time, then even donating a few dollars a month is helping the problem to some degree. Too many adults routinely drive to work, come home, jump on social media, cook dinner, watch the (depressing) news at 11 and then go to sleep. This contributes nothing to your community, and if enough people follow this routine, the community will begin to deteriorate. This is what I believe has happened to the communities in Rochester, New York. Finger pointing hasn’t changed anything yet, so it’s time that we get a better understanding of what we can do as an active member of our communities. Even this very blog is useless without someone taking action based on what they’ve learned by reading this. Serving your community is the best way to address violence involving our teenagers and young adults. If you believe that raising your child alone to be a responsible citizen works in the best interest of everyone, you are mistaken. Your child is connected to family and friends in the community and that connection can render circumstances that you or no one else can control. Even moving away from the community will not change their connection to family living there. In fact, moving away almost seems like we have lost what it means to be a village. Attend town hall meetings, if nothing else but to listen. Volunteer to tutor or mentor kids. Donate $5 or more per month to a local nonprofit organization that focuses on your community. Write, email or call a politician to express your concerns about something in your community. Attend a fundraiser held by a local nonprofit organization. Be the model you want your kid’s friends to be; always maintain a polite, and respectful tone when speaking to your peers and to them. This teaches them by example. Establish a mentor/child relationship with kids; you are not their peer, you are a figure in your community. Earn their respect by imparting wisdom, not by talking at them. Respect kid’s opinions, even if they have a skewed or inaccurate view of things. Offer suggestions to help them find their way and try not to demean them or discard their opinions. No one likes to be disregarded. So in conclusion, I feel that teenagers are “off the chain” because we– the parents and adults in the community– have ignored an integral ingredient to a productive society: serving our communities. Outside of church, I see that most adults have done little to serve the communities they live in. 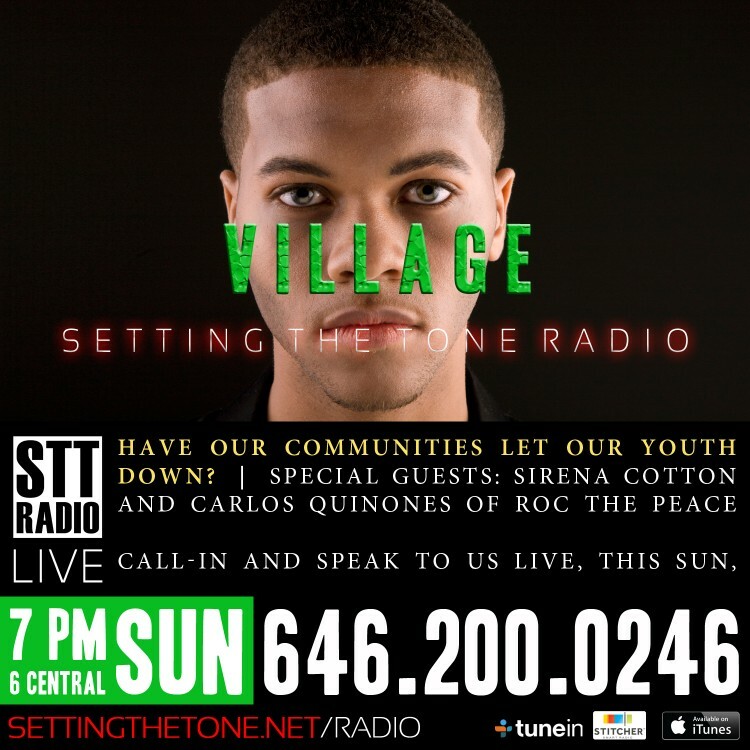 We need to reestablish the “village” structure, regardless of what the media or those outside of your community say. We need to become active and productive instead of nonchalant and judgmental. Our teenagers are a reflection of what we’ve done as a whole, and we can change that immediately, if we begin to do more than what we’re doing now.